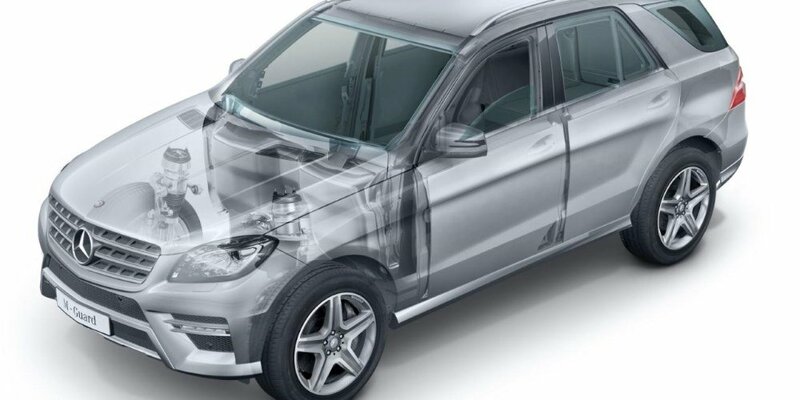 Mercedes-Benz is now offering armoured versions of the ML350 BlueTEC and ML500 which are in compliance with the VR 4 protection class. Mercedes-Benz will now offer armored versions of the Mercedes-Benz M-Class, the ML350 BlueTec and the ML500 classes. They will be armored under the VR4 (VR = Vehicle Resistance) protection class which will include modified doors and a front structure with reinforcing elements. The A, B, C pillars and the roof will feature special enhancement steel, which will also be used to reinforce the passenger area and boost the SUV’s structural firmness. As for the windows, a polycarbonate layer will be fitted on the inside for protection against shards. Both the ML350 BlueTec and the ML500 will ride on 20 inch alloy wheels with flat-run tires which will manage 30 km (18.6 miles) at speeds of 80 km/h (50 mph) even when completely flat. The ML350 BlueTec uses a V6 diesel engine producing 258hp and 620Nm of torque with a 0-62 mph in 9.4 seconds while the ML500 uses a V8 engine that produces 408hp and 600Nm of torque with a 0-62mph time of 6.5 seconds. Both engines are connected to a 7G-TRONIC Plus transmission and have an electronically-limited top speed of 130 mph (210 km/h). The two cars are available to order from 15th March with prices starting from 105,050 EUR for the ML350 BlueTEC Guard and 118,650 EUR for the ML500 Guard. Other models available in the Guard program include the E250, E350, E350 BlueTEC, E500, S600, S600 Pullman and G500.